Barnet was a local government district in south Hertfordshire from 1863 to 1965 around the town of Barnet. Barnet Local Government District was created on September 25, 1863 under the Local Government Act 1858, and was governed by a local board. The Local Government Act 1894 reconstituted the area as an urban district and the local board was replaced by an elected Barnet Urban District Council. The urban district was extended in 1905, 1914 and 1935. The district originally consisted of parts of the parishes of Chipping Barnet in Hertfordshire, and Monken Hadley and South Mimms in Middlesex. The Local Government Act 1888 adjusted the county boundaries in 1889, so that the entire district was in Hertfordshire; forming part of a long, thin protrusion into Middlesex surrounded by that county on two sides, to the north and south. 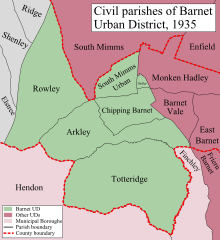 On 30 September 1896 the parish of South Mimms Urban (and therefore Barnet UD) was enlarged, gaining area previously in the parish of South Mimms (South Mimms Rural District). On 25 June the following year the parish of Chipping Barnet was also enlarged, gaining area previously in the parish of Arkley (Barnet Rural District). In 1905 and 1914 respectively the parishes of Arkley and Totteridge were added, from Barnet Rural District. Rowley parish was added on 1 April 1935, created from area of the parishes of Elstree, Ridge and Shenley that lay east of the A1 in the Barnet Rural District. In 1965 the urban district was abolished by the London Government Act 1963 and its former area transferred from Hertfordshire to Greater London. 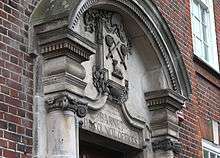 Its former area was combined with that of other districts to form the present-day London Borough of Barnet. The urban district was divided into six wards for elections: Arkley East, Arkley West, Barnet North, Barnet South, Totteridge East and Totteridge West. 1 2 3 4 5 6 Great Britain Historical GIS / University of Portsmouth, Barnet UD population (area and density). Retrieved on 2008-01-28. ↑ "South Mimms Urban CP Boundary changes". A Vision of Britain. Retrieved 31 May 2014. ↑ "Chipping Barnet Ch/CP Boundary changes". A Vision of Britain. Retrieved 31 May 2014. Great Britain Historical GIS / University of Portsmouth, Barnet UD (historic map). Retrieved on 28 January 2008.